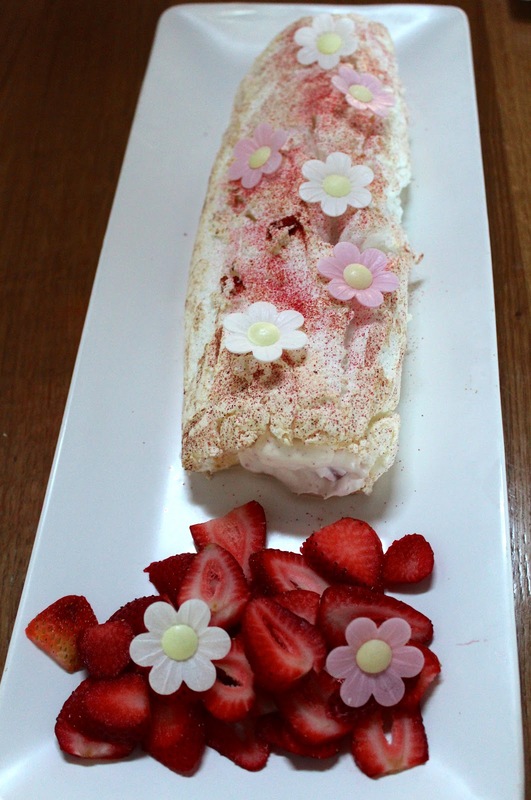 I had a group of British friends around last night so indulged in a yummy (not healthy) gluten free dessert - Strawberry Roulade. But there was method behind my madness! I am working on creating refined sugar free - and maybe even egg free - meringue style dishes. 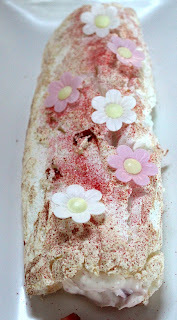 One I wanted to try is a soft roulade where you roll the meringue into a log. But before I try changing a recipe, I want to know what it's like to do it as written, as it is then easier to know if you are on track when you make changes. Gosh - I got quite excited! It was a delicious light dessert that looked so pretty too. I managed to get some of my fruit flour in the recipe too - adding strawberry flour this time! The flour is sprinkled on the top of the meringue and also included in the filling. This sugared version is limited to an occasional treat. As it happens, there were about 20 of us so we each only got a little taste. The recipe says it's for 8 - 10 people. I need to work on a better dairy free filling too as the coconut cream I used in this one, was too coconutty - even with some strawberry flour added. So the experiments continue! I'm having fun! Do you have a favorite meringue style dessert?